3 Bedroom Detached House For Sale in Bath for Guide Price £1,000,000. Situated off a country lane is this cluster of homes including two barn conversions and a farmhouse centered round an expansive courtyard looking over the most beautiful valley. 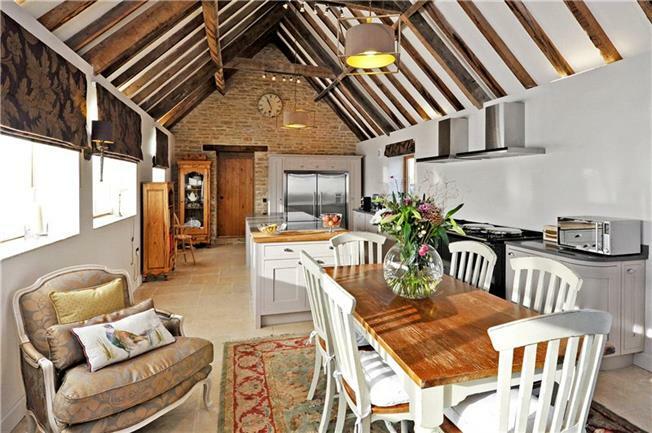 The Dairy is on the west side, and is a beautiful Grade II Listed stone barn. The private gravel frontage leads to the impressive double height wall of windows opening into the reception hall. Oak, stone and glass are the traditional materials that have been given a 21st Century twist in this contemporary yet comfortable home. The reception hall has an oak staircase leading to the first floor where the gallery leads to two en-suite bedrooms both beautifully proportioned with tall A-frame ceilings. The third bedroom suite is located on the far end of the ground floor and makes a wonderful dual aspect bedroom with a private bathroom. One of the most impressive features of The Dairy is the stunning kitchen, dining and living area. Over thirty feet with exposed beams in the tall A-frame ceiling it has been beautifully designed. The hand made kitchen includes a four oven Aga as well as a separate module and integral appliances. A large dining table, seating area and double doors out to the garden makes this the perfect room for entertaining. The sitting room is a cosier affair, with wooden flooring and a free-standing wood burning stove; once again a lovely room. With luxury bathrooms, bespoke kitchen with hand painted units and a beautiful interior design, The Dairy is a truly unique home in a wonderful setting.